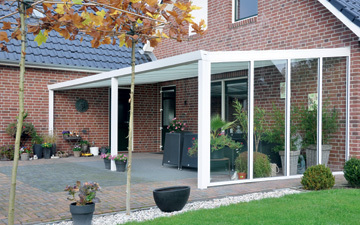 The SunSpaces Infinity system offers full flexibility to create a veranda that matches your aspirations and ambitions. 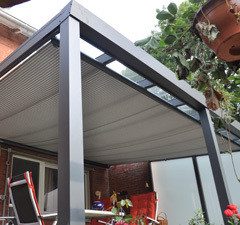 Your personal adaptations to the veranda construction allow you to meet any sun, rain and wind protection needs, as well as helping to overcome any privacy or access issues. 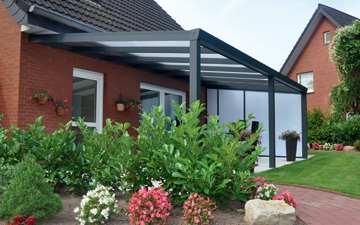 SunSpaces’ unique, low-maintenance aluminium verandas can span up to 5 metres in depth projection and without limit in width. 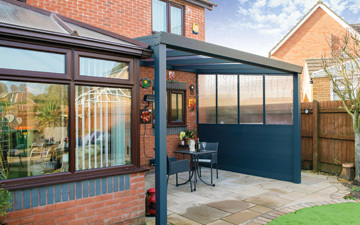 The bespoke option also allows you to customise your veranda – allowing you to add full length polycarbonate or glass end panels, solid aluminium end panels or indeed a combination approach. To create your bespoke veranda, simply select your choice of roof: laminated glass, polycarbonate or heat repelling polycarbonate (blocks 68% of the sun’s heat) and then match with sleek glass side panels, solid aluminium walls or opaque panels for privacy. While most of our competitors only offer a range of standard products, we at SunSpaces pride ourselves on our ability to provide completely bespoke verandas and garden rooms. Whatever you want, we can provide it – the sky’s the limit, and we have dozens of enticing options for you to choose from! Our Infinity range utilises a modular system that allows for a huge range of different sizes. Whether you are looking to build a small reading nook or a sprawling, luxurious dining area, our high-grade products will suit your needs perfectly, and at competitive prices. 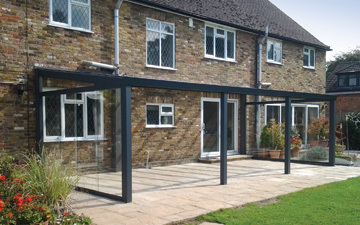 For each bespoke SunSpace we offer a full installation service for customers who would rather not handle the construction themselves, so there’s no need to worry about having to install your veranda on your own! 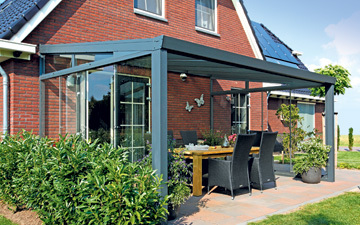 For more information on our bespoke verandas email us at info@sunspaces.co.uk or call us on 0800 085 8110. You can also visit one of our showrooms to see our selection of SunSpaces in person and discuss your project with a helpful advisor. 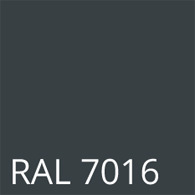 Simply select from your choice of roofing material: glass, or choose from a range of polycarbonate roofs – Clear, Opal or Heat Repelling IR Clear. 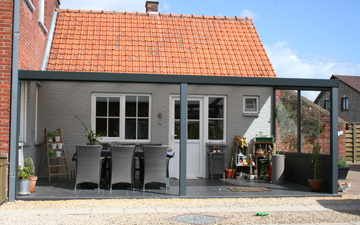 The Infinity veranda comes with a standard gutter cover (see below). We also offer a round gutter cover or classic gutter cover for an additional charge. Consider your options for gutter covers below. 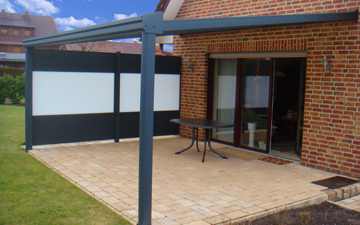 Consider fitting sliding walls to the side sections of your veranda to help shelter you from the elements. We supply a selection of sliding glass panels, made from laminated glass which will help provide wind protection as well as providing you with an unspoilt view. 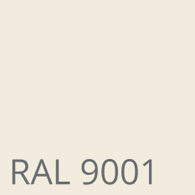 We can also supply opaque glass when required. Whether you require clear or opaque glass, we can supply a range of fixed glass side walls - either full of half height. Made from lmainated glass to provide the ultimate in visibility. 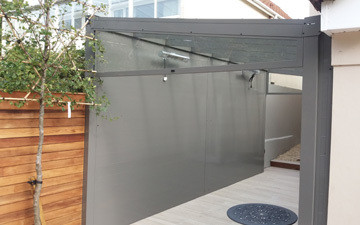 We can supply aluminium walls to one or both sides of your veranda – either full height or half height options are available (combined with glass/polycarbonate infill). 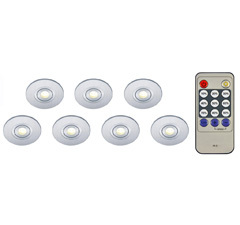 Light up your evenings with our set of 6 LED lights. He kit comes complete with a remote control for ease of operation as well as a transformer. Keep warm on those cold winter nights with the addition of a SunSpaces heater. Choose from a range of state-of-the-art heating systems - view all here. 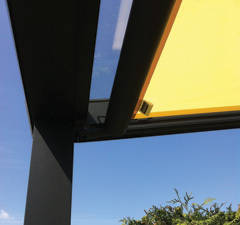 Why not add some shade to your Infinity bespoke veranda with one on our purpose built-in sunshades? 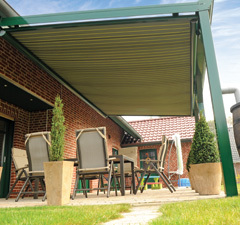 Our shade systems are available in manual or electric systems. This manual sunblind is an ideal addition to the Infinity model. Featuring built-in UV resistant fabric, this sunblind is available in three colours and in a variety of fabric options (See RightSee Above). 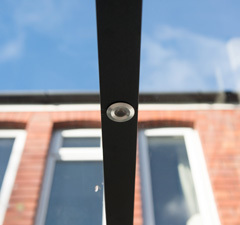 Move between sun and shade swiftly and quietly using this fantastic electric sun blind. 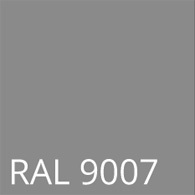 The blind’s fabric has UV resistance to stop fade, and the blinds are available in a range of colours (See Images Below). This system is a heater with a difference. A heater combined with an integrated Bluetooth stereo. This dimmable heater provides a golden glow to proceedings and this combined with the added ability for you to listen to music really does help set the tone. 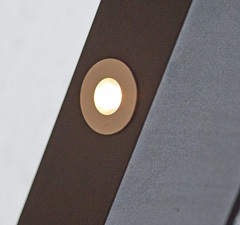 The heater and speakers can be controlled via remote control or by using an app on your phone.